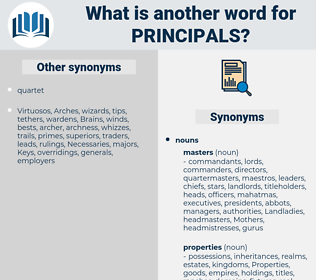 What is another word for principals? 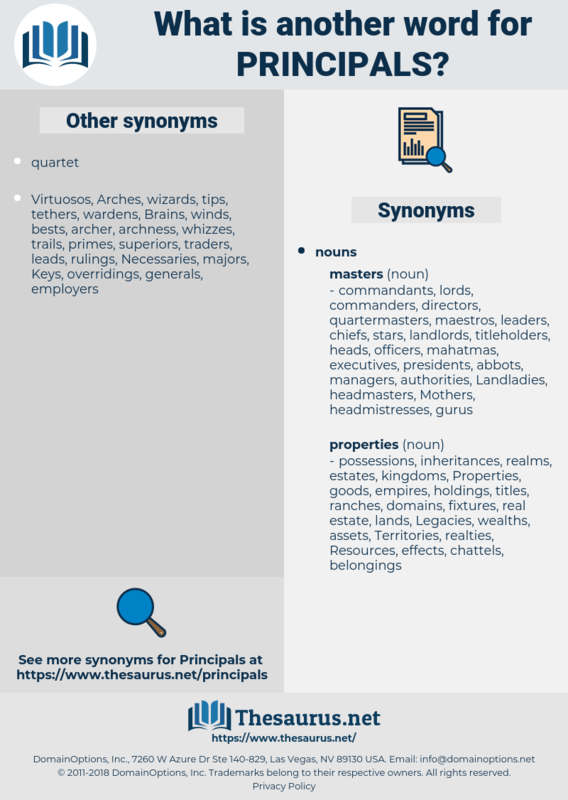 principales, headteachers, managers, producers, supervisors, premises, propositions, guardians, signatories, WGLS, directeurs, chairs, leaders, commanders, fundamentals, principes, Policies, Ones. managerial, co-chairmen, leadership, chairs, leaders, executives, commanders, basics, fundamentals, enlarged, superior, governors, operating, principes, Policies, Broadened, PICC, concepts, philosophy, Ones, UDRP, pests, EDS, dikgosi, cio, HOM, sd, major, primary, chief, chiefs, key, senior, headmaster, vice-chancellor. professional, professionals, principales, protagonists, representatives, commissioners, ideals, vice-chancellors, antimicrobials, Administrators, planners, officials, captains, implementers, headmasters, instructors, managers, considerations, directorships, partners, leaderships, producers, headquarters, responsible, teachers, cornerstones, responsables, supervisors, culprits, administrateurs, contributors, wardens, patrons, policy-makers, professors, controllers, executive, ringleaders, conductors, shareholders, complainants, decision-makers, custodians, premises, directorates, policymakers, handlers, entrepreneurs, CEOS, organisers, co-sponsors, authorities, sponsors, mandate-holders, underpinnings, imperatives, precepts, propositions, Spokesmen, parts, owners, duty-bearers, establishments, mayors, Operators, assignees, assumptions, drafters, aspirants, backbones, co-authors, Constituencies, guardians, rectors, departments, constituents, developers, dirigeants, builders, superiors, masters, Mentors, delegates, upper, perpetrators, managements, papers, directions, surgeons, Clients, entidades, directrices, players, warlords, mainstays, office-holders, branch, Branches, boards, employers, Schools, ingredients, accountable, stewards, filmmakers, portions, doctrines, mangers, Orientations, chieftains, bearers, makers, Proxies, directives, Trustees, admins, highlights, Angles, agents, Bosses, directeurs, elders, guests, rulers, executors, norms, cadres, Foundations, holders, clientele, auteurs, authors, Elites, attackers, execs, offenders, writers, autores, Husbands, Philosophies, Bureaus, surrogates, Virtues, REPS, Agencies, tenets, actors, notions, institutions, DOERS, customers, framers, grounds, bombers, mandates, nominees, divisions, documents, Paths, Statesmen, Spouses, stakeholders, Beliefs, fronts, Parties, frameworks, providers, subjects, counts, Bodies, Bases, units, chairs, leaders, executives, commanders, basics, fundamentals, governors, principes, Policies, concepts, Ones, pests, primary, key. His dealings and connexions, however, were such, that none of the other four would have refused to bail him, had not Clarke given them to understand that, if they did, he would make them all principals and parties, and have two separate actions against each. The men principals - this was rather a surprise to Rose - weren't nearly so pleasant nor so friendly.